Determining value isn’t as easy as it used to be before the existence of the internet. With so many options coming from all corners of the globe, how do you what is good quality? This is a problem many homeowners encounter when looking for storage sheds online. To ease your task, we review the 9 best sheds on the market and tell you how to narrow down your choices. 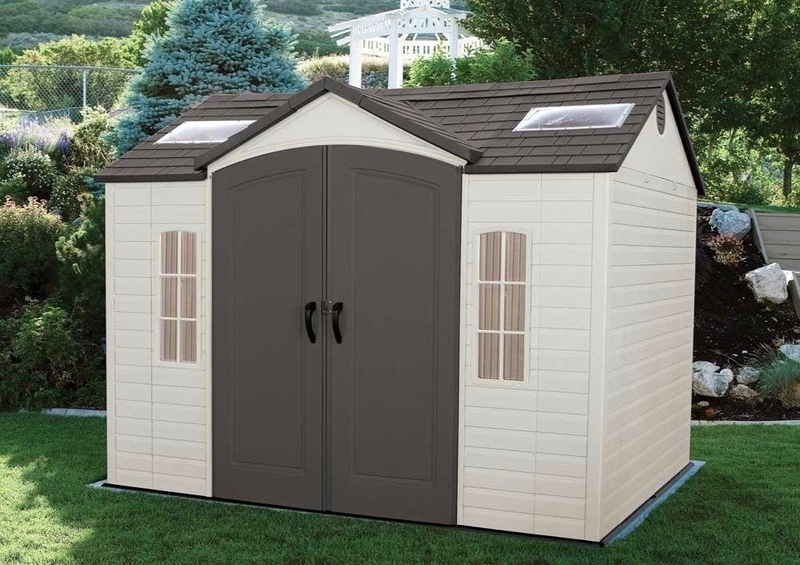 The Lifetime 6411 is a great looking 8′ x 7.5′ plastic shed with enough space to store large gardening equipment. It is built with dual-wall, high-density polyethylene and reinforced with steel for longevity. As you would expect with a Lifetime shed, this unit is UV protected to prevent cracking and fading. The high pitched roof does a good job of draining rain and snow while lockable, steel reinforced doors with internal latching mechanism keep your things safe and secure. The roof also supports a-frame trusses, providing a 6’8″ headroom. There are two screened vents for air circulation. Lifetime uses a shatterproof polycarbonate window and three small skylights for interior lighting. You get a 90″ x 9″ shelf, two corner shelves and two 30″ x 10″ shelves to organize your gardening tools. The Lifetime 6402 has a nice combination of quality, price, size, appearance and organizational features. 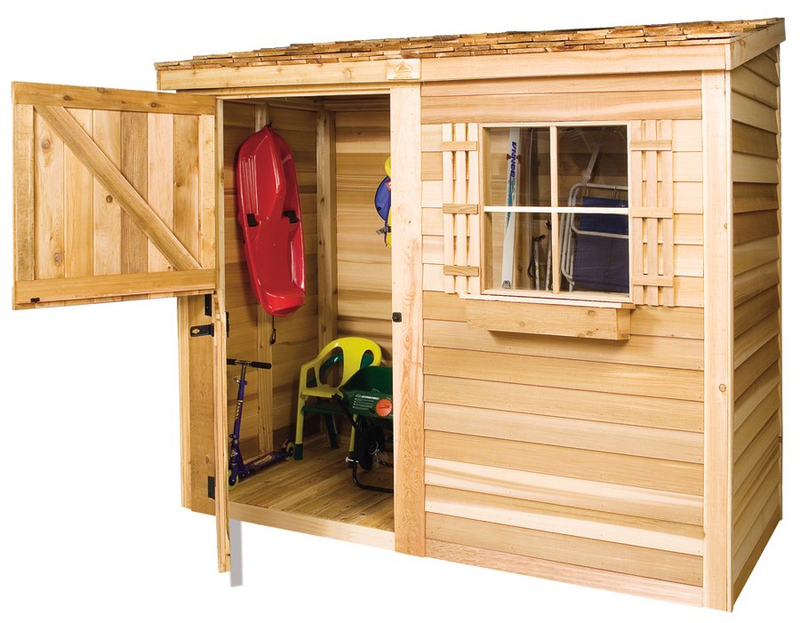 Lifetime offers a variety of garden sheds, all of which are backed by a 10-year warranty. This particular model offers 620 cubic feet worth of space, which is plenty of room to store your riding lawn mower. You still get enough walk-in room for when you need to access other items. The unit built using high-density polyethylene and reinforced with steel beams. The double walls are heavy and sturdy, which is crucial for a storage shed to survive rough storms. It has slip resistant flooring made from polyethylene that won’t stain or chip easily. 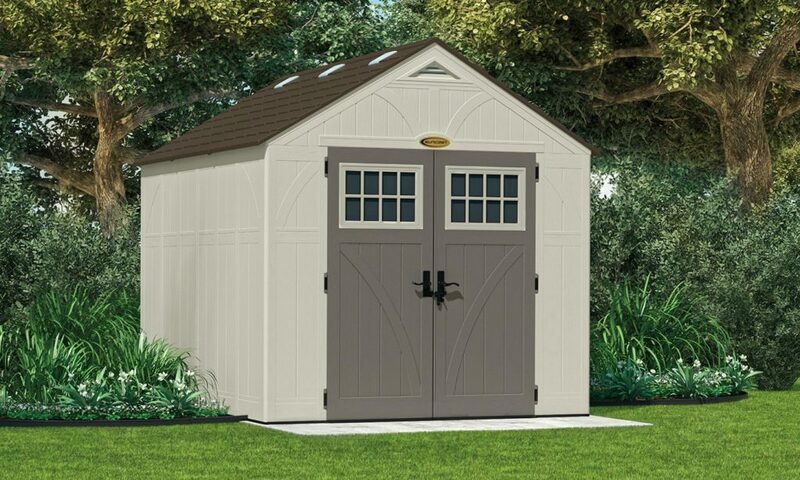 Like most Lifetime sheds, this one is coated with light creamed-color powdercoat that protects against fading. For organization, you get a 90″ x 9′ shelf, two corner shelves and two 30″ x 10″ shelves. It uses a sliding and locking window as well as two screened vents for adequate air circulation. Also included are two peg strips and five small skylights. Yet another wonderful Lifetime product is the 60005, which features shelves and peg strips with tool hooks to help you find what you need without much hassle. It is made with high density polyethylene material that is reinforced with powder coated steel for added longevity. The unit is strong, weather resistant and doesn’t chip or crack easily. The high-arched, steel reinforced door has an internal latching mechanism and offers a 4′ by 6′ opening. Also featured is a high-pitched roof that supports a-frame trusses to provide a 6’8″ headroom and drain any rain or snow effectively.light. The prospect of clearing the house and organizing everything in an 8′ x 10′ outdoor shed is a vision shared by many homeowners with the desire to overcome repetitive future maintenance. The Suncast BMS8100 Tremont 8′ x 10′ allows one to break from the above frustrations. It is designed to enhance your garden with delectable style with an attractive slate effect roof and stoney tint doors. This storage shed has a modern look and boasts the durable that only resin can provide. A combination of weatherproof resin facade, floor, roof and doors with steel reinforcements is what makes the Treont 8′ x 10′ really stand out from the competition. Its apex design is a huge plus when it comes to draining rain and snow. The floors are fortified to survive the extra weight of heavy garden tools while the double wall doors keep your belongings safe and secure. Skylights and windows allow natural light to infiltrate while the air vents do a good job of ensuring adequate air circulation. The generous height allows for easy movements inside the unit. Large garden sheds often provide added space at the cost of quality, stability or some other important feature. The Lifetime 11ft W x 11ft D is a spacious storage shed kit that ticks all the boxes to stand out from the competition. It is certainly designed with your small and large items in mind. 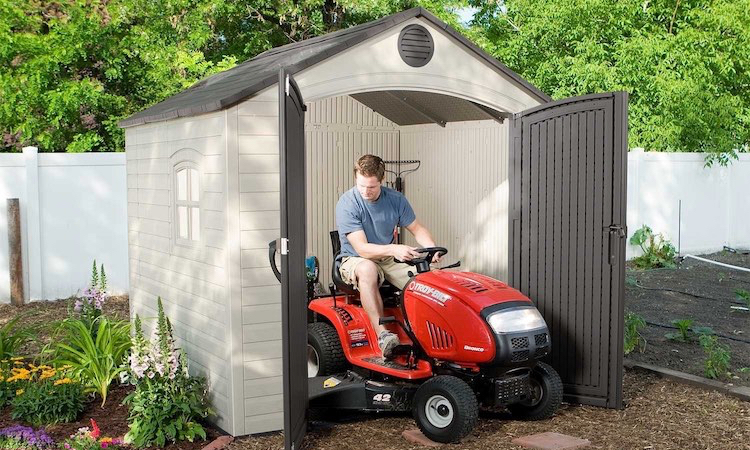 The shed has a large interior space and features a tri-fold carriage style door that allows you to easily drive your ride-on mower inside. There are several windows and skylights to infiltrate daylight as well as screened vents to ensure that atmosphere inside the shed remains clean. You also get two large shelves and two peg strips with hooks to organize the small items. The 11ft W x 11ft D garage shed is built to last long with double walled polyethylene walls and powder coated steel frames. The floor is stain resistant and very easy to clean up. Other notable features include internal spring latch, exterior padlock loop and interior deadbolts. 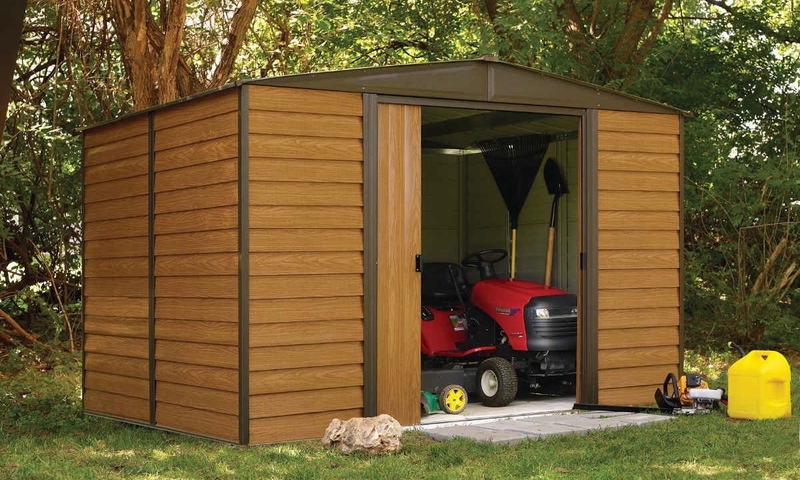 If you are looking for a durable steel shed that has the realistic look of a wood shed, the Arrow WL108 Woodlake 10′ x 8′ is worth considering. 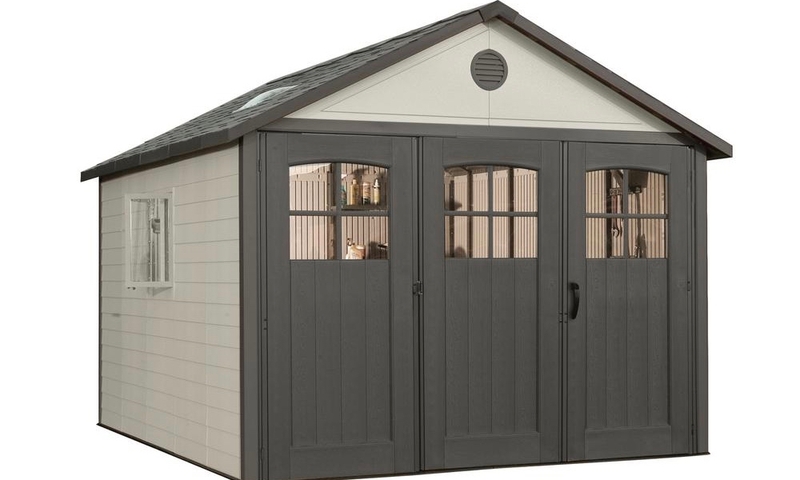 At less than $600, it is also one of the cheapest backyard sheds you will find. It is quite easy to assemble thanks to the included precut and pre-drilled parts. However, its main appeal is the fact that it is constructed with steel and coated with wood to give it a wood grain look. Many users cited their love for the durable construction achieved with galvanized steel treated with zinc for corrosion resistance and double bracing. It offers 413 cubic feet of interior space for storing your items. The dual swing doors provide wide entry for you to easily retrieve lawn maintenance equipment or patio furniture. This rectangular storage door will keep all of your valuables safe all year long. It is designed with non functional window, a Cedar Dutch door for easy access and retrieval of items, all weather building materials. It offers a great combination of resilience, beauty and stability, which other wood sheds find hard to achieve. Cedar Shed uses natural oils to preserve the wood and protect it from decay or damage by insects. This shed is crafted from Western Red Cedar and features cedar shingled roofs that are waterproof. It comes in a kit that also includes prebuilt panels, a window and door for added security. Assembling the unit will not be a problem. If you are looking for the best shed for the money, here are a few factors that will help you narrow down your options to find the right model for your needs. The most important part of any shed is the foundation. You must build your shed on a level surface. Otherwise, it won’t assemble properly. You can create a pad with compacted pea gravel. A compacted road base or cement patio are also good options worth considering. Make sure you build the foundation after you’ve made your purchase. This is because different manufacturers include step-by-step instructions for building a foundation that suits the specific model you purchase. If the foundation instructions aren’t included, you will need to learn how to build a level foundation. Don’t make a mistake of installing the shed in a low lying area where water could easily drain into it. You want to ensure that your shed is built to last long. Good material options include tongue and groove flooring and treated plywood floors. When it comes to the siding material, natural wood is the most preferred option. It is important to remember that some woods contain resins that are resistant to rotting. Cedar is such a wood and very popular for making shed siding. However, you will need to coat it with UV inhibiting preservative once a year to protect it from UV solar radiation. If you want a maintenance free shed, consider a model with vinyl siding. It lacks the visual appeal of natural wood, but that is a worthy tradeoff. Steel sheds should be avoided as the material is susceptible to rust. If you must have metal siding, rust free aluminum is a sensible choice. Plywood and particle board siding are made from pieces of wood that have been compressed and glued together. They are more affordable than natural wood siding, but don’t make sense in areas where it rains a lot. It is important to ensure that your outdoor shed match the existing structures and blend in nicely with the landscape design. You can choose a color that matches the roof for the door. A barn style with treated wood siding would be a good way to create a rustic look while a shed with a flower box and a window or two will result in a refined look. You can even paint the shed to match the color of the existing structures. Rather than have your shed stick out like a sore thumb, you can use plants around the unit to blend it into the landscape design. Installing trellises against the walls and adorning them with vines is also an idea worth considering. While budget is always an important factor when making a purchase, it is important to understand that cheap can sometimes prove expensive. It is good to consider buying the best quality shed your budget allows for. It is not always easy to determine the exact size you need. You should think about the kind of items you would be bringing in and out of the shed. Make sure that the shed you choose has a door that’s both wide and tall enough to accommodate those items. 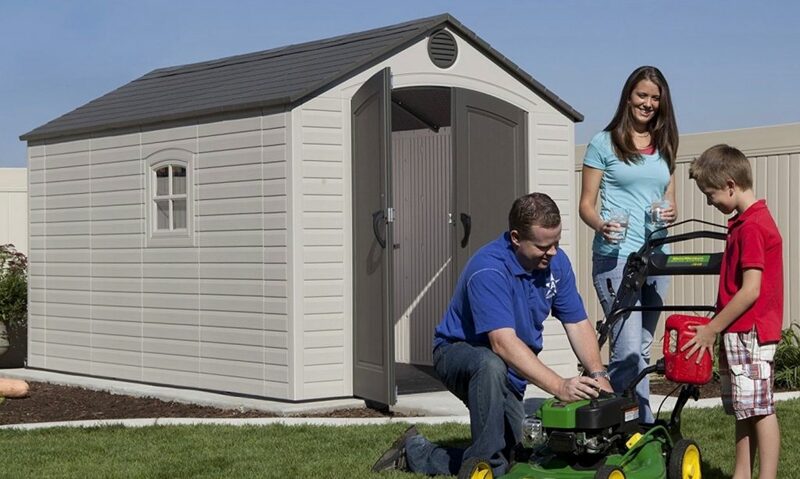 To be on the safe side, always purchase a shed that is 25% larger than what your size needs are. This allows for flexibility in case you need to store larger items in the future. You will need to check the local building regulations before making your purchase. Temporary units built at the factory don’t usually require a permit but regulations will vary from region to region. Make sure you become acquainted with the deed restrictions and zoning ordinances. These codes and regulations will let you know what kind of siding materials are acceptable and how far back from the property line you can install your shed. So what shed is best for your yard? Do you prefer the long lasting metal shed or the ease of construction offered by plastic and resin sheds? What about the natural look of wood?